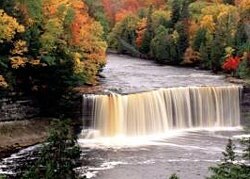 Tahquamenon Falls State Park encompasses close to 40,000 acres stretching over 13 miles. Most of this is undeveloped woodland without road, buildings, or power lines. 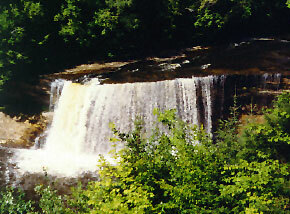 The centerpiece of the park, and the very reason for its existence, is the Tahquamenon River, with its waterfalls. One of the largest waterfalls east of the Mississippi. It has a drop of nearly 50 feet and is more than 200 feet across. A maximum flow of more than 50,000 gallons of water per second has been recorded cascading over these falls. Four miles downstream is the Lower Falls, a series of five smaller falls cascading around an island. Although not as dramatic as the Upper Falls, they are equally magnificent. The falls can be viewed from the river bank or from the island, which can be reached by rowboat rented from a park concession. The island walk affords a view of the falls in the south channel. Rising from springs north of McMillan and drains the watershed of an area of more than 790 square miles. From its source, it meanders 94 miles before emptying into Whitefish Bay. The amber color of the water is not rust nor is it muddiness; it is caused by tannin leached from the Cedar, Spruce and Hemlock in the swamps drained by the river. 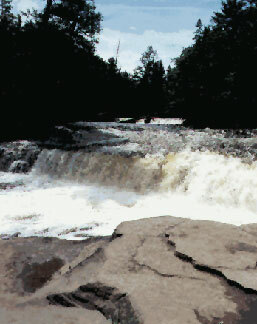 The extremely soft water churned by the action of the falls causes the large amounts of foam, which has been the trademark of the Tahquamenon since the days of the voyagers. The park offers visitors a wide variety of recreational opportunities. During the spring and summer, camping, hiking, fishing, canoeing, nature study and photography are popular activities. Fall colors provide a beautiful picturesque view of the park. In addition, hunters will find ample opportunities to pursue their sport. Winter offers opportunity for snowmobiling, cross-country skiing and snowshoeing with miles of marked trails. Ice formations along Lake Superior and frozen waterfalls are a photographer’s delight. Moose are occasionally seen wandering through the park, and from time to time, bald eagles are also spotted by visitors. Black bear, coyotes, otter, deer, fox, porcupine, beaver and mink are a few of the other wildlife which can be seen in the park. The abundant bird life includes spruce grouse, sharptail grouse, pileated woodpeckers and a variety of waterfowl and songbirds. One of the few nesting sites in Michigan for the sandhill crane is found in the park. 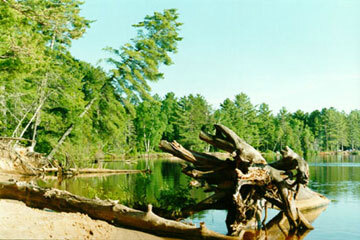 Four campgrounds are available in the park; two modern campgrounds at the Lower Falls and a modern and semi-modern campground at the Rivermouth. Each of the modern campgrounds have approximately 90 sites and each site is equipped with electricity, a fire pit and a table. Hot showers and flush toilets are also features of the modern campground. Sanitation stations are available at the Lower Falls and Rivermouth Units. There is no campground located at the Upper Falls. This is the land of Longfellow’s Hiawatha – “by the rushing Tahquamenaw” Hiawatha built his canoe. Long before the white man set eyes on the river, the abundance of fish in its waters and animals along its shores attracted the Ojibwa Indians, who camped, farmed, fished and trapped along its banks. In the late 1800’s came the lumber barons and the river carried their logs by the millions to the mills. Lumberjacks, who harvested the tall timber, were among the first permanent white settlers in the area.